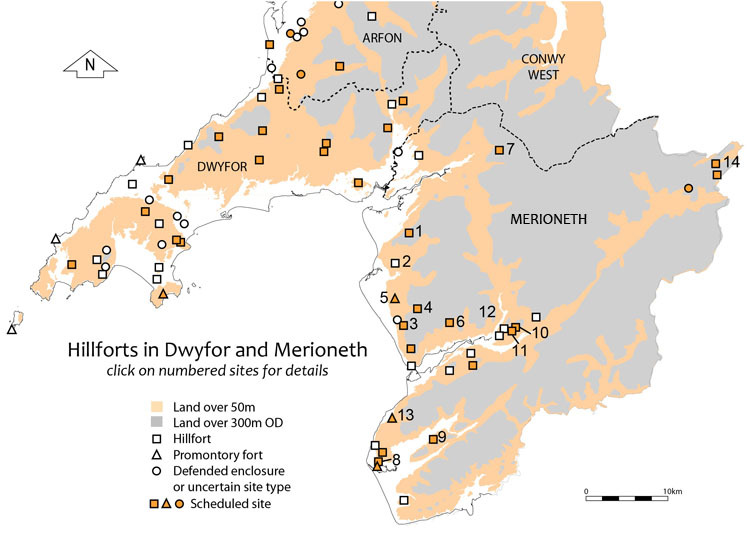 This guide provides information on the location of and access to the main Iron Age hillforts in Meirionnydd, all but one of which lie within the Snowdonia National Park. It also provides a description of the main features of each fort that can be seen by a visitor. It is designed for the average interested visitor and does not presume a previous knowledge of archaeology. There are more forts than are listed here but those not included are on private land and are not accessible or of less visual value. Please read the notes for visitors, below. Some of the routes are permissive over private land. Others cross Access land, which must be accessed by available rights of way, gates and stiles. Obtain a reliable local weather forecast before you set off. Take an Ordnance Survey map and compass. Take appropriate clothing - waterproofs, spare warm clothing, hat and gloves, food and drink. Be prepared for rough ground. Do not walk over the stoney parts of hillfort structures. If weather conditions turn bad, turn back. Don't rely on mobile phones. All these forts are protected as Scheduled Ancient Monuments and it is illegal to disturb them in any way or to carry out metal detecting over them. Do not walk over the stone parts of the structures, which can be damaged by trampling. An Ordnance Survey map is needed to make use of the guide. This would preferably be the Explorer 1:2500 maps OL18 and OL23.